I decided to flip open my latest Fine Cooking issue and make whatever was on that page…yes, a favorite around here, any kind of risotto and there was a bonus little twist, parmesan broth which is new to me, but I do save all of my parmesan rinds and since it was meant for risotto what the heck? Now with that little tidbit of info in my brain I’ve decided that it will become a favorite ingredient to many dishes. FC’s recipe is easily adaptable so every time you pass the cheese case grab a container and store in the freezer. Find the instructions below. In a small bowl, whisk the anchovies, garlic, lemon zest and juice, mustard, honey, 3/4 tsp. salt, and 1/4 tsp. pepper. Drizzle in the oil, whisking until emulsified. Gently stir in the chives. 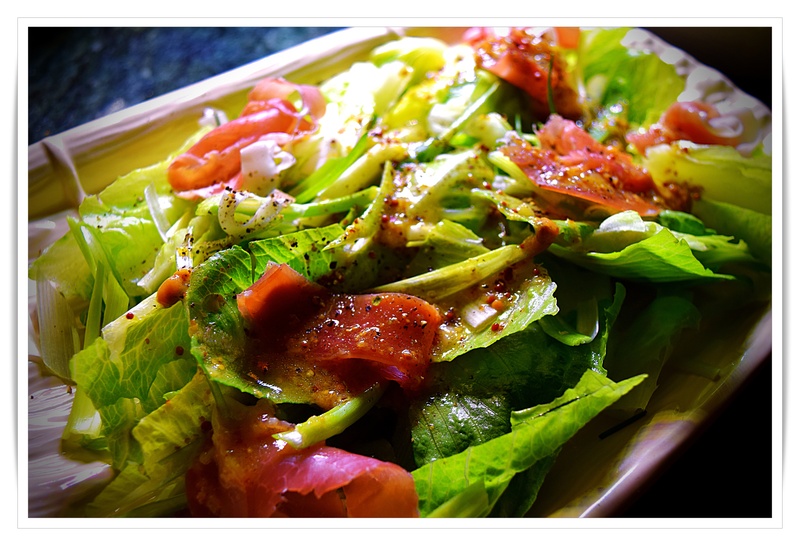 Arrange the lettuce on a platter, drizzle with most of the vinaigrette, top with the prosciutto, drizzle with the remaining vinaigrette, and serve. Combine cheese rinds, thyme, bay leaves, and peppercorns in a large pot. Fill a large pot with 5 quarts cold water, bring to a boil over high heat. Reduce to a simmer, partially cover, and cook, stirring occasionally, until the broth is fragrant and light golden, 1 to 1-1/2 hours. Strain the broth through a medium-mesh sieve set over another pot or a bowl large enough to hold the broth. Heat a tablespoon of the butter and a tablespoon of the oil in a 12-inch skillet over medium-low heat. Add 1 Tbs. of the shallots and cook, stirring occasionally, until tender, about 2 minutes. Add the squash and 1/4 tsp. salt. Add just enough broth to cover the squash, 1 to 1-1/2 cups. Bring to a simmer, reduce the heat to low, cover, and cook until the squash is just tender, 5 to 6 minutes. Remove from the heat and set aside. I like my cubes of butternut squash to hold together so don’t cook until it is very soft. In a 5-to 6-quart Dutch oven or other heavy-duty pot, heat 1 Tbs. of the butter and the remaining 1 Tbs. oil over medium-low heat. Add the remaining shallots and cook, stirring occasionally, until tender but not browned, 2 minutes. Add the rice and cook, stirring, until lightly toasted, about 2 minutes. Add the wine and cook until the bottom of the pot is almost dry, 2 to 3 minutes. Ladle in just enough hot broth to cover the rice (about 1-1/4 cups), and cook, stirring, until the broth has reduced to below the rice. Add more broth to cover, and continue cooking and stirring the rice in this manner until the rice begins to look translucent, 5 to 10 minutes. Add the squash and any broth from the skillet. 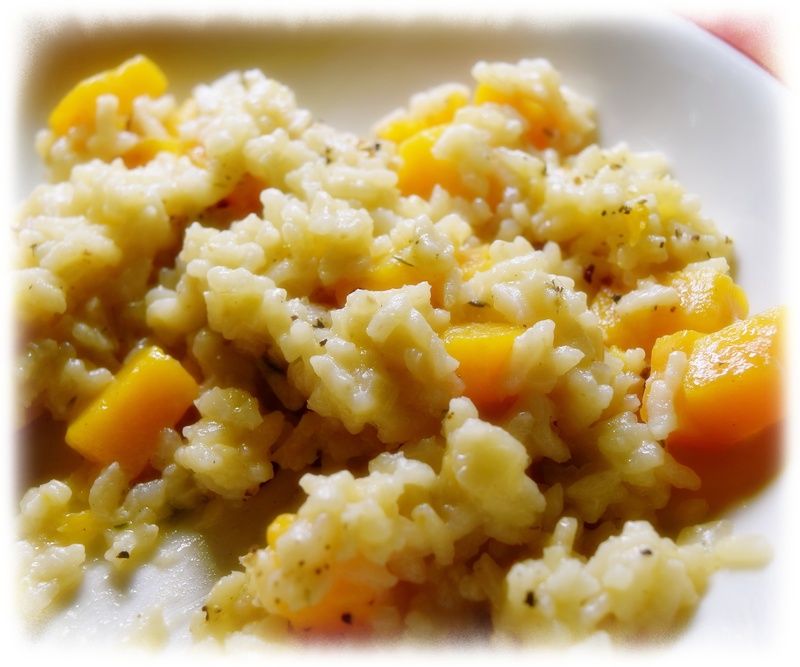 continue cooking, adding more broth as needed, until the rice is al dente, the squash is very tender, and the dish looks creamy, another 10 to 12 minutes. Season with 1 Tbs. salt and 1/2 tsp. pepper. Add the remaining 1 Tbs. butter, the grated cheese, and thyme, and stir until the cheese melts. Season to taste with salt and pepper, and serve.